Do you need to find a quick and easy way to get your home cleaned? Why not try hiring professional cleaning service? We are offering you the most convenient one you will ever find. 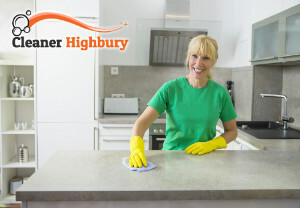 Our company is an outstanding cleaning services provider and we have been operating here in Highbury N5 for many years. We pride ourselves in being well informed and understanding of what our clients want and need, and we are more than qualified to give it to them. Let us take care of your home’s hygiene, give us a call now. Bathroom – they will scrub wall and floor tiles, they will de-scale bathtub and shower, remove soap scum, clean and sanitise the toilet, clean the mirror. Get rid of mould, if any. Kitchen – they will damp wipe all kitchen appliances, cupboards and counters. They will clean the microwave inside and out; clean and disinfect the sink. Living areas – vacuum and flip mattresses, dust all pieces of furniture, deodorise, polish wooden surfaces. They will do the general cleaning chores, like vacuum the carpeting, mop the floors, clean windows internally, dust all pieces of furniture thoroughly. If what we offer seems acceptable to you, do not hesitate to pick up the phone and call our phone assistants right away. They will answer any further questions you might have about our packages and prices, and will help you make an appointment. Get the best cleaning service in N5 and our unmatched cleaners to clean your home for you. You will not regret your choice, we promise.